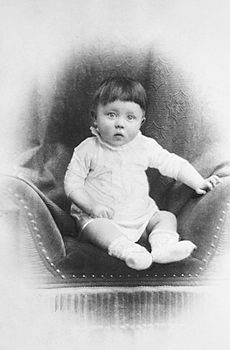 Adolf Hitler (20 April 1889 in Braunau am Inn, Austria – 30 April 1945 in Berlin) was the leader of Nazi Germany. Hitler also led the NSDAP (often called the Nazi Party), the democratically elected party which ruled Germany at this time. He became Chancellor of Germany in 1933. This appointment was allowed by the German constitution. 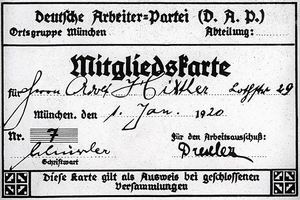 Hitler became dictator (complete ruler) in 1934. He called himself the Führer (leader) of the German Empire. The Nazis created a dictatorship called the Third Reich. In 1933, they blocked out all other political parties. This gave Hitler absolute power. Nazi forces did many war crimes during the war. They were doing what Hitler told them to do. They killed their enemies or put them in concentration camps and death camps. Hitler and his men persecuted and killed Jews and other ethnic, religious, and political minorities. In what is called the Holocaust, the Nazis killed six million Jews, Roma people, homosexuals, Slavs, and many other groups of people. While Hitler was in prison, he wrote a book with the help of his close friend Rudolf Hess. At first, Hitler wanted to call the book Four and a Half Years of Struggle against Lies, Stupidity and Cowardice. In the end, he called the book Mein Kampf (My Struggle). 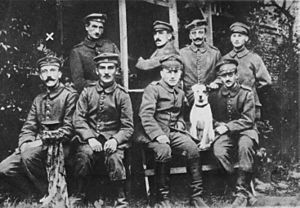 Hitler started World War II by ordering the German Army to invade Poland. His army took over Poland and most of Europe, including France and a large part of the Soviet Union. During the war, Hitler ordered the Nazis to kill many people, including women and children. The Nazis killed six million Jews in the Holocaust. Other people that the Nazis killed were Roma (Gypsies), homosexuals, Slavs such as Russians and Poles, and his political opponents. 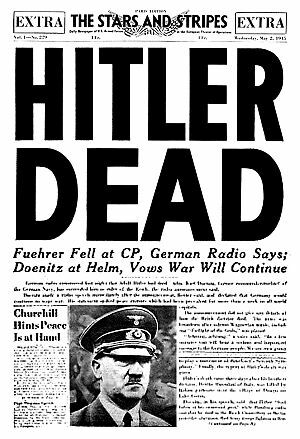 Less than 24 hours after Hitler and Eva Braun got married in Berlin, both of them used poison to kill themselves. Before this, Hitler ordered that their bodies be burned. This prevented him from being captured alive by soldiers of the Red Army, who were closing in on him. Adolf Hitler Facts for Kids. Kiddle Encyclopedia.